The previous Week remained much volatile owing to outcome of Gujarat Elections but speaking on a overall note, it ended on better-than-expected note. The benchmark NIFTY50 ended with net gains of 159.75 points or 1.55% on a weekly basis. We expect this positive intent to continue but we still see all chances that the clean breakout may still await the Markets despite the Index ending at a life-time closing high. The next week remains a short week with Monday remaining a trading holiday. Next week will still remain susceptible to profit taking at higher levels as Markets awaits a clean break out. Also, bearish divergence persists on the lead indicators. The next week will see the levels of 10535 and 10670 playing out as major resistance levels. The supports come in at 10410 and 10280. The Relative Strength Index – RSI on the Weekly Chart is 63.6098. 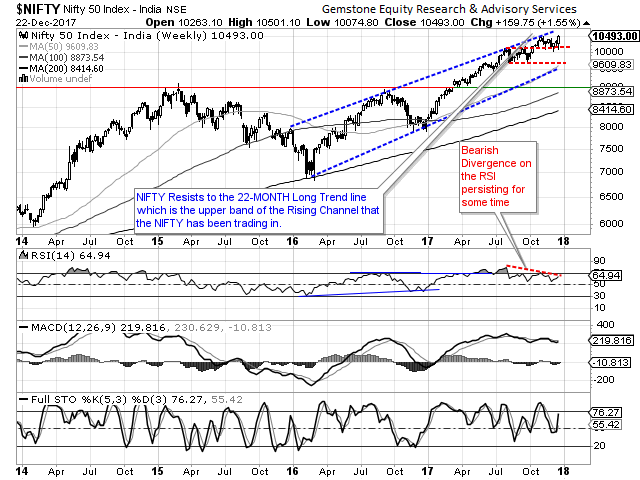 A bearish divergence is evident on this indicator as the NIFTY has set a fresh 14-period high while the RSI has not. Also, it has continued to form lower tops and is yet to breakout from this formation. The Weekly MACD is still bearish while it trades below its signal line. No major formations were observed on Candles. Overall, though the Markets may have ended at a life-time Closing high, it is evident that the clean breakout is still awaited. 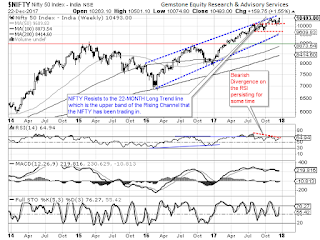 There are two factors that would weigh against the Markets achieving a clean break out. First, in an instance the Markets inches higher, it will encounter pattern resistance of the 22-month long rising trend line. Secondly, there is clear Bearish Divergence on the lead indicators which may prevent the Markets from either giving a clean break out or from sustaining it at higher levels. Cumulatively speaking, all these factors keep the Markets still exposed to corrective profit taking bouts at higher levels. We recommend continuing to approach Markets on a cautious note with protecting profits at each higher level. 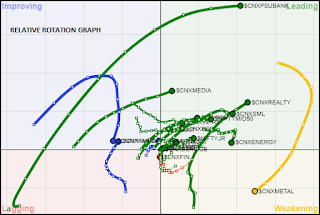 A study of Relative Rotation Graphs – RRG show that AUTO pack has shown considerable improvement in its relative performance. This is likely to continue in the coming week as well. Along with this, the MIDCAP universe is likely to outperform along with the broader markets. METAL and PHARMA are evidently losing momentum and this under-performance is likely to be seen in the coming week as well. The FMCG, REALTY, PSUBANK and MEDIA will see their select components relatively out-performing the Markets. ENERGY pack is not likely to see any major action this coming week.